A suggestion of quitting windsurfing was the best motivation reader Michael Fairrie ever received. Read on to find out why. Words Michael Fairrie // Photos Steven Quigley & Claire Fairrie. Originally published within the October ’16 edition. So I guess you’ll be giving up windsurfing, you certainly won’t have any spare time, that’s what happened to me” was the sagely advice from my neighbour when talking to him outside my house next to my heavily pregnant wife. Then he came in with the second body blow, “You’ll no doubt be selling your gear, and your van.” As we were expecting twin boys I knew I was looking down the barrel of a life changing event, but giving up windsurfing was not something that I had ever even considered, and selling my gear – well hold on a minute. I’ve lost count on the number of times I’ve been asked, “what size are you rigging up?”, a universal greeting amongst strangers on the beach and old and new windsurfing friends. But more alarming, I’ve also lost track of the numbers of excuses I’ve heard for people quitting windsurfing: work, family, backaches, no spare time and even kitesurfing. This throw away comment from my neighbour had a real impact, and left me thinking. 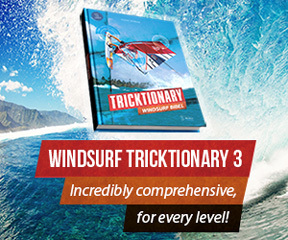 No more windsurfing?, if it can happen to him can it happen to me, that can’t be right?. Giving up wasn’t even an option I had considered! Was this true?, would I end up being another casualty making excuses for quitting!. No, no way, this throwaway doorstep comment turned out to be the best windsurfing motivation I’d ever received. The reason his comments touched a nerve was that for me windsurfing is so much more than just going out sailing, it’s representative of so many things: freedom, energy, creativity, exercise, natural beauty, health – the list just goes on. It’s a lifestyle, an identity of being a windsurfer, and as life gets busier the need to have a place to escape for a few hours grows, and for me that place has for many years been windsurfing. The excitement and sometimes slight fear of arriving at the beach in sub 5 metre weather quickly banishes the stresses of life to a distant corner of the mind. For me there is no form of exercise that gets close to working every muscle, joint and tendon in your body the same way that windsurfing does. With endorphins pumping, a good session leaves you feeling broken yet buzzing and, like an addiction, just wanting to go back for more. Through windsurfing I’ve met people with the most infectious energy and zest for life, people who push boundaries and find a great balance between family, work, time on the water and for the things that are really important. With increasing work and family commitments I had perhaps left attempts at competitive windsurfing too late. For me catching the odd wave, jumping high, claiming the occasional forward and clocking up half decent GPS times gives untold pleasure and everything I want from windsurfing. Despite considering myself a fairly advanced windsurfer it’s great to be reminded that there is just so much more to learn. A while ago I spent an evening discussing fins, well actually the stiffness of fins. I came away knowing a bit more about fins, but also realising that we hadn’t really scratched the surface of this whole new area of windsurfing I’d previously given little thought to, having simply gone with manufacturer supplied or recommended kit. For sure I still want to keep learning, but alarm bells about risking injury ring a little more loudly now. I still want to push myself and dream of windsurfing on Maui with my family. The same goes for work, lots of things I’m still going to achieve, but windsurfing and family has helped shape a brilliant work life balance. Personally being with my family and sharing experiences with them is the most important thing, and seeing my now nearly 5 year old boys playing in the sea is priceless. I’m not making some dramatic statement that windsurfing changed my life, but it has most certainly contributed and inspires me to live life to the absolute full. It was the realisation and possible fear of stopping windsurfing that shaped the way I work to ensure a healthy life balance, which for me is so important for one’s soul, family time, and life generally. Now to some extent my neighbour had a point, the van did get sold and replaced with a more suitable family wagon but the kit certainly didn’t, and due to a hugely supportive wife and the good fortune and ability to frequently squeeze sessions in around my work, I rarely miss a great forecast. Becoming a parent is, as it should be, a totally life changing event for which I feel blessed everyday, well nearly! It’s the best job ever, but everyone needs a break from even the best job and squeezing in a quick sail before or after work or grabbing a couple of hours at the weekend is somehow more rewarding and recharging than lazy weekends of old spent waiting for the wind and the disappointment when a forecast didn’t deliver. I’m grateful for every session I get on the water, and also more accepting of those windy days missed. 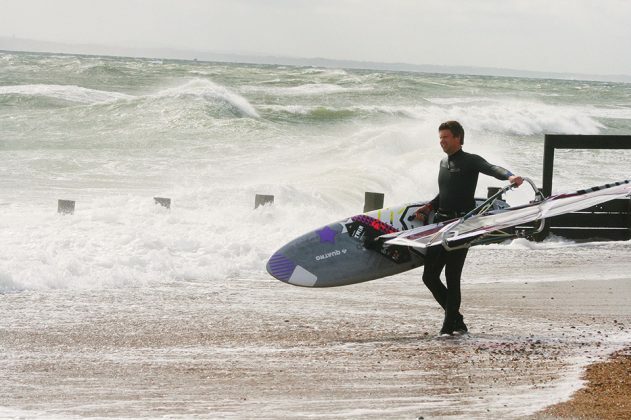 Windsurfers are a dogged breed, who else would get excited by appalling weather forecasts, drive miles in the hope of a decent session and invest hours getting battered in the process to perfect carve gybes, forwards etc. Applying the same dogged determination to creating a work life balance has enabled some great things. Being a quitter isn’t compatible with windsurfing, I’ve spoken to so many people who’ve said, oh I used to windsurf but this got in the way, or work was too busy or this excuse or that, don’t let it be you making the excuses!